Kilkenny Ormonde Hotel, located the heart of Kilkenny City, is one of the top Family Hotels in Kilkenny. This family friendly hotel in Kilkenny is in an ideal location to allow you to make the most of a number of exciting activities and events on your very doorstep. The hotel also provides a number of family friendly amenities and services all of which are detailed below. Hotels with Kids Clubs are hard to find. That’s why the Kilkenny Ormonde Hotel offers Stars Club during holiday time so that your children can enjoy their holiday too! 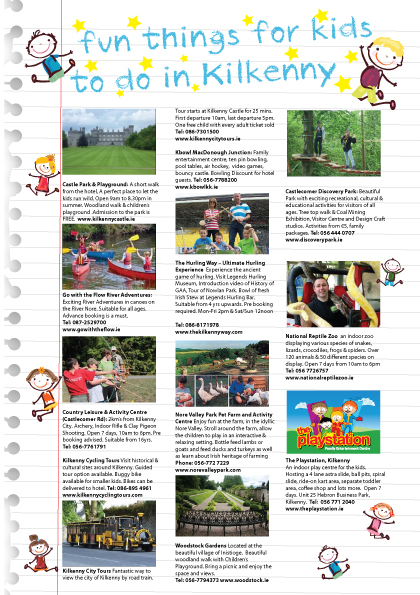 The ideal choice for Family Hotels in Kilkenny. Spa Treatments at KO Spa & Beauty for Mum & Dad.